By	Allyson Haymaker. Last edited by Marios Alexandrou on April 11, 2019. When Utah was still a territory, with miles and miles of forbidding wilderness between settlements, Cove Fort provided a way station for travelers and their livestock. Today, this historic site “in the middle of nowhere” provides a welcome respite for modern travelers — and a glimpse into our pioneer past. Utah's early settlers built the 12-room fort from volcanic rock and limestone quarried from the surrounding hills in 1867. Now restored and filled with period artifacts and furnishings, Cove Fort looks so homey that you feel as though you could move right in. 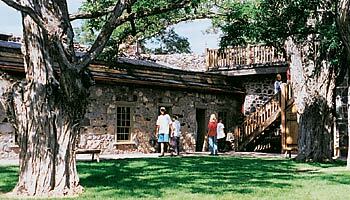 You can take a guided tour, which includes a short video shown in an authentic log cabin across the road, or explore the fort and outbuildings on your own. Cove Fort is at the junction of I-15 and I-70 in central Utah, about 130 miles south of Provo. It's open daily from 8 a.m. to sunset. Admission is free. For details call 1-435-438-5547.